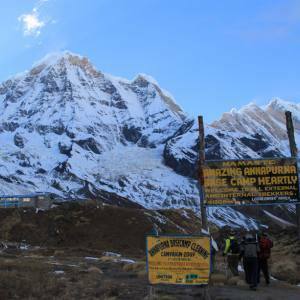 For the easy trek in the Annapurna region with amazing Himalayan scenery and in short duration, Royal Trek is an excellent trip for you. This is an outstanding trip for the family travel and have a magnificent experience. The name behind the trip is named after Prince Charles, who enjoyed this trek in 1980s. 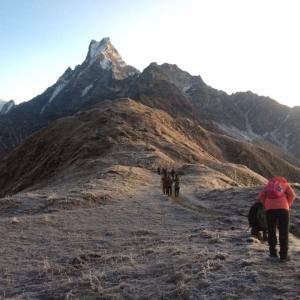 Are you looking for the easy trekking in Nepal? Then, grab the excellent offer of Nepal Kameleon Holidays in Royal Trek near Pokhara. 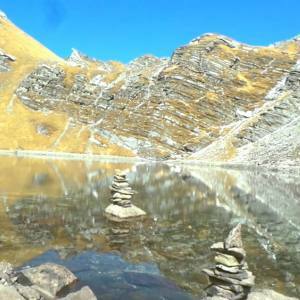 Royal Trek is also known as the short trek in Annapurna. After exploring the UNESCO listed monumental sites in the Kathmandu valley, drive/fly to Pokhara, the picturesque town that is surrounded by the Lakes. The trek embarks from Bijayapur Khola, after driving from Pokhara. The trail is easy, which escorts you through the rhododendron forest with the accompaniment of the dramatic Himalayan scenery. It leads you through the Gurung hamlets that are outstanding. The local culture of the ethnic people and traditions are superb. 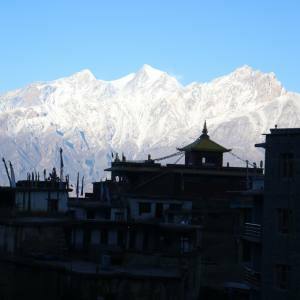 The Annapurna peak, Fishtail, Himchuli and the surrounding peaks can be seen magnificent. Trekking via Kalikasthan, Syaklung and Chisapani, the trek concludes at the Begnas Lake. The Lake is brilliant and you can enjoy boating. Driving to Pokhara, the trip ends. 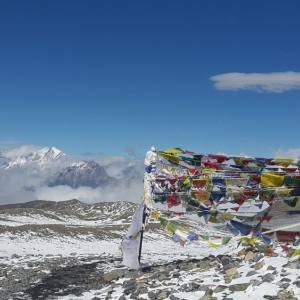 All the seasons are suitable for the Royal Trek in Nepal. March to May and September to November are the most preferable seasons for this trek. 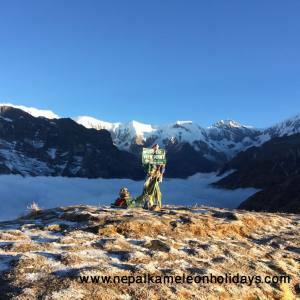 Nepal Kameleon Holidays operates the trek with all the arrangements. Please, feel free to contact us for more details. Day 01: Arrival at Kathmandu (1350 meters), transfer to hotel. Day 06: Chisapani to Pokhara. Day 01Arrival at Kathmandu (1350 meters), transfer to hotel.Namaste and welcome to Nepal. At your arrival at the Tribhuvan International Airport, Nepal Kameleon Holidays’ representative receives and transfers you to the hotel. After a short refreshment, we briefly explain you about the following day's itinerary. Overnight at hotel. 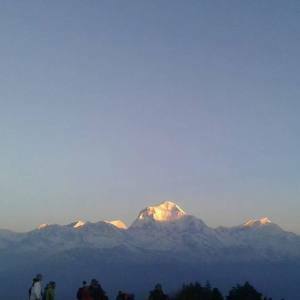 Day 02Fly or drive to Pokhara (850 meters). 6-7 hours drive/30 min flightWe drive through the Prithvi Highway to Pokhara, which is about 6 hrs journey. As an option: you can fly directly from Kathmandu to Pokhara for half an hour. The Himalayan panoramas on your right can be explored. The boat riding on the Phewa Lake can be a superb activity in the afternoon. Overnight at hotel. Breakfast included. Day 03Pokhara to Kalikasthan (1370m): 1 hour drive and 5 hrs walkAfter the breakfast at the hotel in Pokhara, we take a drive to the Bijayapur Khola and embark the trek. The easy trek goes through the fields and we have our lunch on the way. Then we cross the River, we climb up towards the Kalikasthan. We have some time to explore around the village and the typical lifestyle of the countryside. Overnight at home stay. Breakfast, Lunch and dinner included. Day 06Chisapani to Pokhara. The fabulous trail from Chisapani escorts us to Rupa Lake after the breakfast. Rupa Lake is one of the fantastic Lakes in Pokhara valley. Then we climb up towards the ridge of Sundare Danda. It's another a quarter hour to reach to the huge and magnificent Begnas Lake, which is the most brilliant Lake in Pokhara for the boating experience. Then we drive further to Pokhara and transfer to the hotel. Overnight at hotel. Breakfast, Lunch and dinner included. Day 07Drive/fly back to Kathmandu.From Pokhara, we drive back to Kathmandu and transfer to the hotel. As an option of driving, there is half an hour flight to Kathmandu. Driving takes about 6 hours. Stay relaxed in the evening or walk around the local place. Overnight at hotel. Breakfast included.